The Lincoln Stars will wrap up the 2014-15 regular season this weekend with a home-and-home series against the Omaha Lancers. Friday's contest will take place at the IceBox in Lincoln. Saturday evening's game will be played at the Ralston Arena in Ralston. Puck drops at 7:05pm CST for each game. The Stars are in last place in the USHL western conference with a record of 17-36-5 (39 points). Lincoln is 1-7-0 in their last eight games played and were outscored 45-19 in those eight contests. The 36 losses by the Stars this season ties the team record for the most losses in one season with the 2009-10 team that finished with a record of 16-36-8. Click here to view the current league standings. The Omaha Lancers are firmly in third place in the USHL western conference with a record of 33-17-8 (74 points). These games this weekend will be the seventh and eighth times the Stars and Lancers will have met this season. Lincoln is 2-3-1 in the past six contests against Omaha this season. Stars forward Ludvig Hoff has 9 points (3g, 6a) in the six games vs. the Lancers this season. Lancers forward Shane Gersich also has 9 points (5g, 4a) in six games vs. the Stars. The Lancers cannot finish the season any higher or lower than third place in the west, so it will be interesting to see how competitive they are this weekend considering they may not have a lot to play for. Omaha has had a recent rash of injuries and their head coach was actually suspended one game by the USHL "for his team receiving their 3rd instigator penalty of the season." I've been told by an acquaintance who is a Lancers fan that leading scorer Jakob Forsbacka-Karlsson will likely not play this weekend against the Stars. JFK hasn't played for the Lancers since 3/13/15, so I assume he's injured and the coaches are saving him for the playoffs. As for the Stars, they have called up two of their more talented younger players on their affiliate list in '98 forwards Ethen Frank and Dominick Mersch. Both will play the final two games of the season against Omaha. Frank was selected by the Stars in the 2nd round of the 2014 USHL Futures Draft. The native of Papillion, NE tips the scales at 5'10", 175 pounds. Ethen was called up by the Stars for one game back in December of 2014 where he scored 2 points (both assists) in Lincoln's 7-5 win over the Musketeers in Sioux City. Frank scored 90+ goals this past season for the Omaha AAA U16 program. Ethen has committed to play college hockey at Western Michigan University, but he will be back in Lincoln next season and should play a prominent role as a top six forward. Frank will wear #39 this weekend. Mersch was selected by the Stars in the 1st round of the 2014 USHL Futures Draft. The native of Park Ridge, IL tips the scales at 6'0", 175 pounds. Dominick will be playing in his first USHL games this weekend for the Stars. This past season for the Chicago Mission U16 program, Dom scored 16 points (12g, 4a) in 25 games played. Dominick has committed to play college hockey at the University of Wisconsin, but like Ethen Frank, Mersch will be back in Lincoln next season and will be another young player counted on to do big things. With the addition of Ethen Frank to the lineup, for the first time ever, the Stars will have two Nebraska natives (Frank, Ethan Price) in the lineup. Coincidentally, Frank and Price both played for the Omaha AAA program. Stars forward Waltteri Hopponen will miss the final two games this season as he will be participating in the World U18 Championships, representing Team Finland. A reminder, the Lincoln Stars are hosting a town hall meeting on Friday, April 10th at 5:15pm at the IceBox. Stars GM Jon Hull will be available to answer questions from the fans who attend. Lincoln owner Ryan Schiff will not be in attendance. Free pizza will be provided. You must have a ticket to Friday's game to attend the town hall meeting. If there is anything you'd like to get off your chest about what has transpired this season, on or off the ice, this is your time to do it. I get a ton of anonymous comments left on this blog when things don't go right for the Stars (yet I hardly ever get comments when they are winning), so I hope all those anonymous people show up to the town hall meeting this Friday and voice their concerns. Voicing them here on this blog as an anonymous entity doesn't do much, honestly. The Stars' front office personnel may or may not read the comments here, but even if they do, it's hard to take them seriously when there is no name behind them. 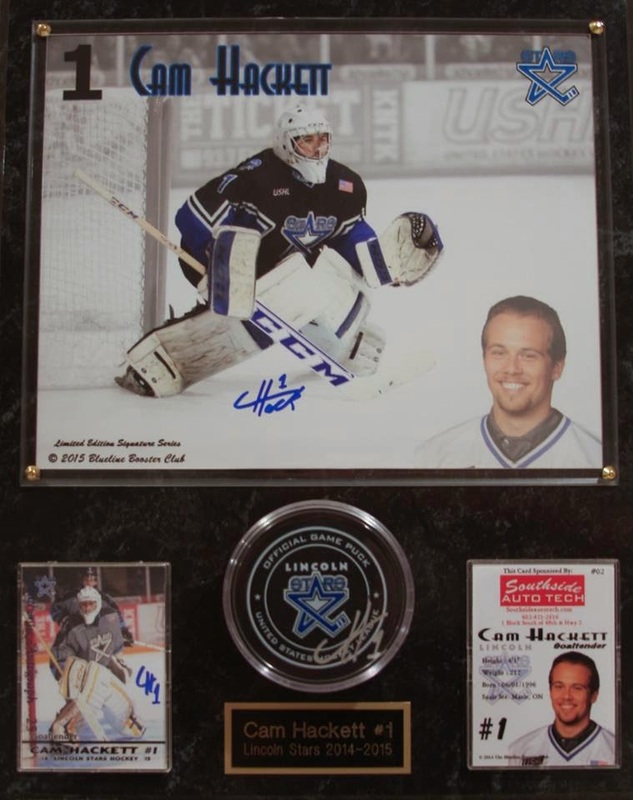 Also, the Blueline Booster Club will be having their annual player plaque spring auction during the game on Friday. The starting bid on all player plaques will be $50.00, and the "Buy It Now" option will be $125.00 per plaque. Bidding will begin at 6:00pm and go until 5 minutes remaining in the 2nd intermission. The auction sign-up sheets will be located in the south hallway of the IceBox. Proceeds from the auction will go to the cost of the trading card packs. Click here to view photos of all of the player plaques up for auction. I've included a photo to the left of what your typical player plaque will look like. Well, the Stars won't be participating in the USHL Clark Cup playoffs this year, but you could say that Lincoln's playoffs will be this two-game series vs. the Lancers. It's hard to know how competitive Omaha will be this weekend since they don't have a lot to play for, other than pride. 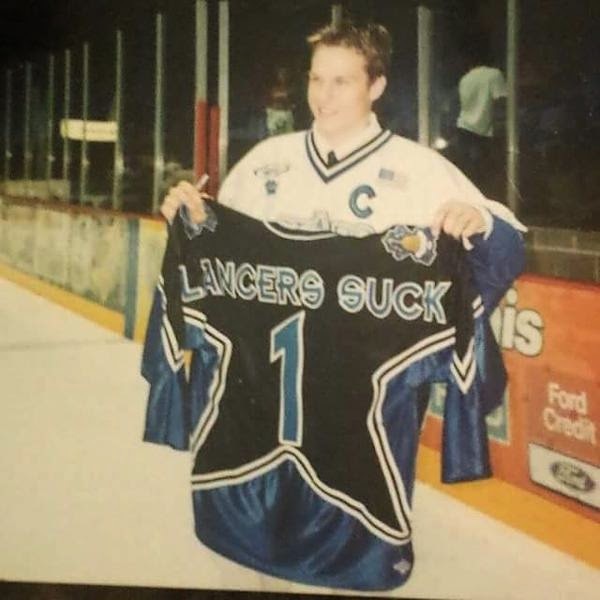 I'm sure the Lancers don't want to head into the playoffs on a losing streak, either. I'm hopeful the Stars can forget the losses and disappointment of this season and really come out strong this weekend against their rival and put two quality 60-minute efforts together. Finish out the season with a bang and some positivity. It's been one horrible season but, I am hopefull that the boys can gear up over this offseason and mature a little (including our coach If he is back) and put together a beautiful run with the amount of potential veterans on the team. Here we go stars nation two last chances to show up and beat omaha no better way to end a season. I know it's been rough but nothing heals wounds like beating omaha. Let's go boys get it done this weekend. Go stars and thanks for all of your effort as usual this season yeti, hopefully you have now positive things to blog about next year. Here is to a better season come fall. Go stars! I recently read that an anonymous comment or complaint has as much value as an unsigned check - none. If you want your comments to have value you have to sign them. And having said that, I admit I still say things "off the record."